Agar's Air Fresheners and Deodorisers control and remove unwanted odours with a beautiful lasting fragrance. Except for Country Garden, all Agar's Air Fresheners contain a detergent and perfume to simultaneously clean and deodorise in one easy step. Shop here, save time and money with these dual-action Air Fresheners - ideal for various cleaning applications and jobs. 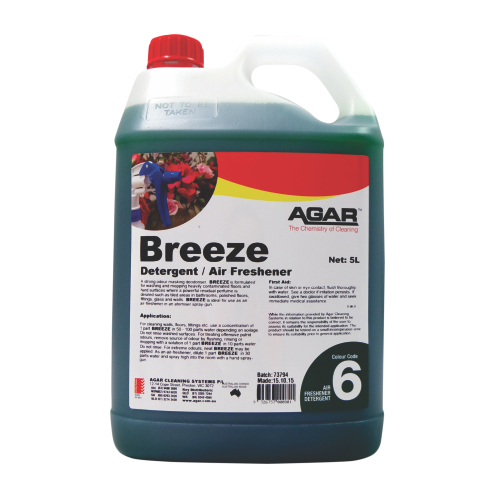 Agar Breeze Detergent Air Freshener is a strong odour masking deodoriser with a powerful cleaning action and a fruity fragrance. It is good for washing and mopping all hard surfaces. It has a detergent power which helps remove dirt and grime. 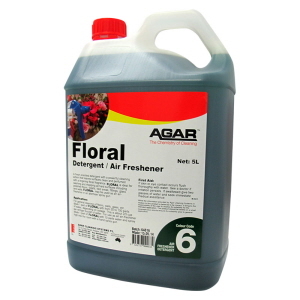 Agar Floral is a strong odour-masking detergent with a floral-fruity fragrance. It is used as an air-freshener and for washing and mopping floors and hard surfaces such as tiles, polished floors, glass and walls. You can use Agar Floral Air Freshener with water to mop the floors. Doing this will leave a nice scent. You can also spray it in the room to hinder strong unpleasant odours. Agar Lavender is a strong odour-masking detergent with a lavender fragrance. It is used as an air-freshener and for washing and mopping floors and hard surfaces such as tiles, polished floors, glass and walls. 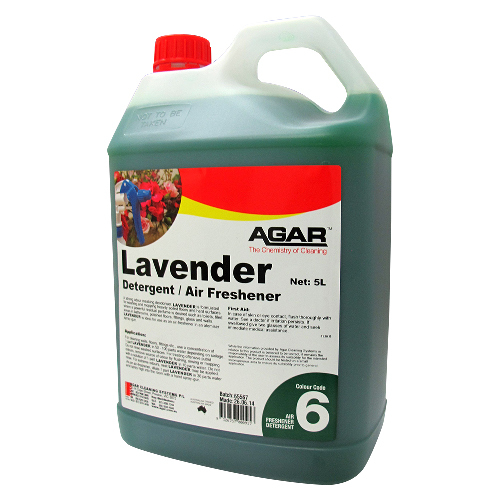 Agar Lavender Air Freshener has a cleaning action needed to remove offensive and putrid soilage matter. Ideal for use as an air-freshener where reodorant is needed. 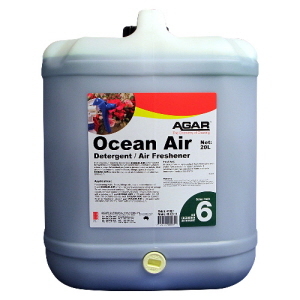 Agar Ocean Air odour masking detergent with a pleasant fresh fragrance. This deodoriser has a powerful cleaning action that leaves surfaces clean. Agar Ocean Air is effective for treating offensive odours where a powerful residual perfume is required. Suitable for washing and mopping all hard surfaces including polished floors, tiled areas, fittings, glass and walls. 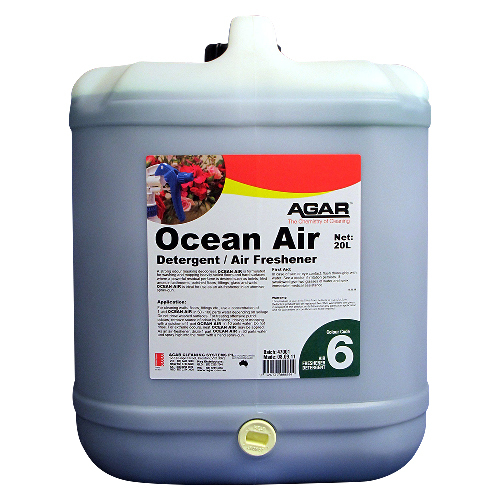 Agar Ocean Air deodoriser is works well as an air freshener in an atomiser spraygun. Agar Spice is an odour masking detergent with a lingering, fresh detergent with a powerful cleaning action that leaves surfaces clean and perfumed with a pleasant spicy fragrance. This deodoriser has a powerful cleaning action that leaves surfaces clean. 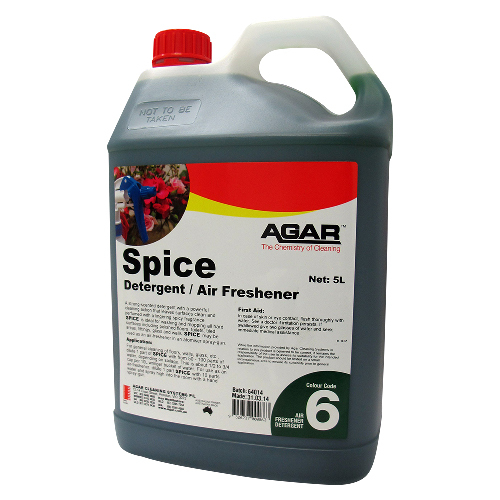 Agar Spice is suitable for washing and mopping all hard surfaces including polished floors, tiled areas, fittings, glass and walls. Agar Sweet Talc Deodoriser Detergent is a lasting, fresh-scented detergent with a powerful cleaning action ideal for washing and mopping hard surfaces, and as an air freshener. It can be used on polished floors, tiled areas, glass, walls and fittings. Agar Sweet Talc is environment-friendly, phosphate free and non-flammable. This deodoriser conforms with all statutory environmental requirements. It is based on safe ingredients selected to perform efficiently so there is no waste or damage. 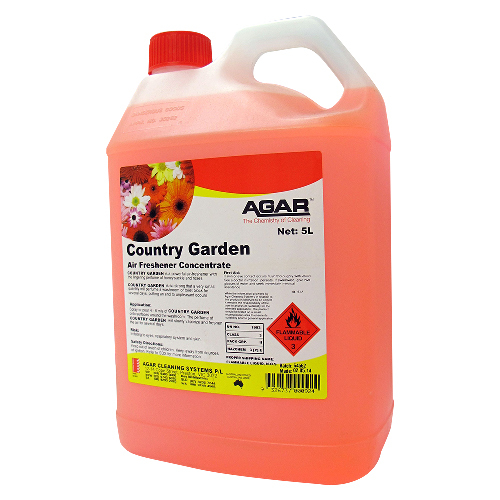 Agar Country Garden Air freshener Concentrate with a long lasting floral fragrance. A few drops provide a powerful long lasting fragrance. It is designed to mask undesirable odours where normal detergent and disinfectant perfumes are gone sooner then you desire. Great for use on washrooms and toilet cubicles. Agar Freshaire has a strong appealing perfumed odour neutraliser and antibacterial detergent. It removes offensive odours from hard surfaces, carpets, clothing and furnishings. This biodegradable detergent has a unique excellent four-way action to neutralize problem odours. Agar Freshaire are great in removing offensive odours from hard surfaces, carpets, clothing, furnishings and upholstery. It is very useful in nursing homes, hospitals, laundries, toilets, rubbish dumpers, garbage chutes, trucks, kennels, animal pens, and etc.